China problems take their toll. Low gas prices have also been taking a bite out Tesla's stock price in recent weeks. However you count the numbers, it wasn’t a good quarter for Tesla Motors. The Silicon Valley battery-carmaker has been embroiled in controversy for its use of non-standard accounting practices that, critics say, make its balance sheet look a good bit better than it might with more traditional bookkeeping. But there was no way to perfume Tesla’s weak fourth-quarter performance, when it sank $107.6 million, or 86 cents a share, into the red. That was $74.7 million more than it run up in losses during the same period in 2013, in part due to problems selling all the vehicles it produced at the end of the year. The maker did hit its production target of 35,000 vehicles for all of 2014, but ran into trouble finding a home for all those Model S sedans. China was a major part of that problem. Among other things, it has run into concern among potential buyers about the lack of a ready recharging infrastructure in the country, a spokesperson told TheDetroitBureau.com. For his part, Musk said Tesla will “fix the China issue and be in pretty good shape, probably in the middle of the year.” It is attempting to set up a network of chargers around the Asian nation’s key cities, much as it has been doing in the U.S. But Musk also appeared frustrated by the concerns the China problems have raised with investors, in a Wednesday webcast saying the issue “is being blown way out of proportion.” Perhaps, but he had earlier billed China as a critical source of new demand for the maker. Tesla’s revenue for the fourth quarter did rise 44%, to $1.1 billion, during the fourth quarter on a non-GAAP basis. Using standard accounting methods, revenues rose to $957 million. 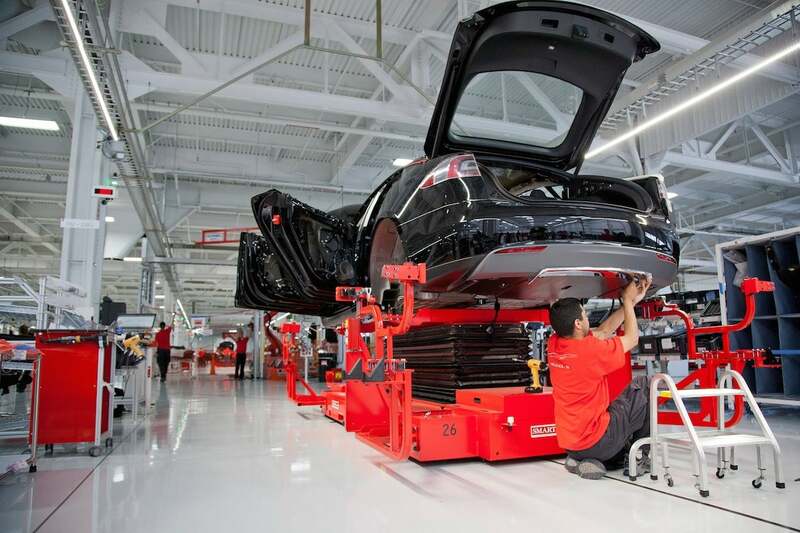 For the full year, Tesla lost $294 million compared to a $74 million deficit in 2013. Tesla released its number after the market closed on Wednesday, but investors were already anticipating bad news, driving the stock down $3.49, or 1.6%, to $212.80. Traded as TSLA, it continued to lose ground in after-hours trading. Tesla shares are off from a 52-week high of $291.42. Tesla recently launched a multi-city tour to tout its latest version of the Model S, the high-performance all-wheel-drive P85D. A more critical test will come with the upcoming launch of its next product line, the Model X sport-utility vehicle. It is currently slated to begin rolling out during the third quarter of 2015 — but it is already two years behind schedule. This entry was posted on Thursday, February 12th, 2015 at and is filed under Automobiles. You can follow any responses to this entry through the RSS 2.0 feed. Both comments and pings are currently closed. There must be some folks with rose colored glasses investing to drive the stock price to almost $300. Evidently some body didn’t perform due diligence. That’s 2 BILLION in the hole so far and counting.